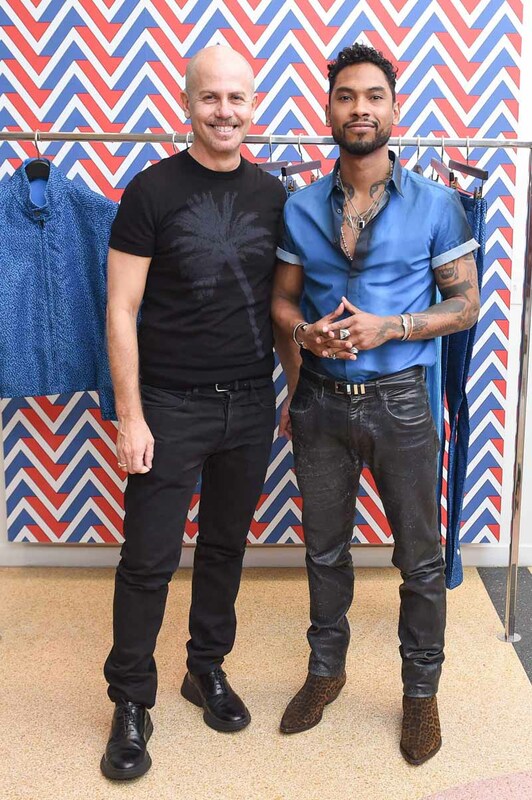 Art and fashion always go hand in hand at Art Basel in Miami and on December 4, 2015, that saying ran true to form as Calvin Klein Collection’s Men’s Creative Director, Italo Zucchelli unveiled an exclusive men’s Pre-Spring 2016 Calvin Klein Collection capsule. The event was co-hosted by Webster’s CEO and Co-Founder Laure Heriard Dubreuil; and Instagram artist Doug Abraham (@bessnyc4). For the event, Mr. Abraham collaborated with photographer Steven Klein to curate three limited edition art pieces that incorporated images from an archival Calvin Klein Collection ad campaign. The images were auctioned at the event and all sales proceeds were donated to the Ali Forney Center, which benefits homeless LGBTQ youth. The party was attended by an eclectic mix of influencers from the fashion, art and entertainment worlds. For the event, Calvin Klein Collection wardrobed Ms. Dubreuil, Mr. Abraham and musician Miguel. Each of the men’s looks was designed by Mr. Zucchelli, and Ms. Dubreuil’s look was designed by Francisco Costa, the brand’s Women’s Creative Director. Mr. Zucchelli created an exclusive selection – in addition to commercial pieces – from the Pre-Spring 2016 line for both of The Webster’s stores in Miami and its latest location at Bal Harbour Shops. The capsule is comprised of quintessential menswear silhouettes – sport jackets, t shirts, hooded sweaters, trousers and shorts – that were inspired by the spirit of Miami. All of the pieces are rendered in lightweight, athletic fabrics for warm weather wear. A vibrant shade of cyan is used throughout, either contrasted with solid navy or translated into dynamic wave or coral prints.